Mueller appeared at an event before the 2016 Detroit auto show. 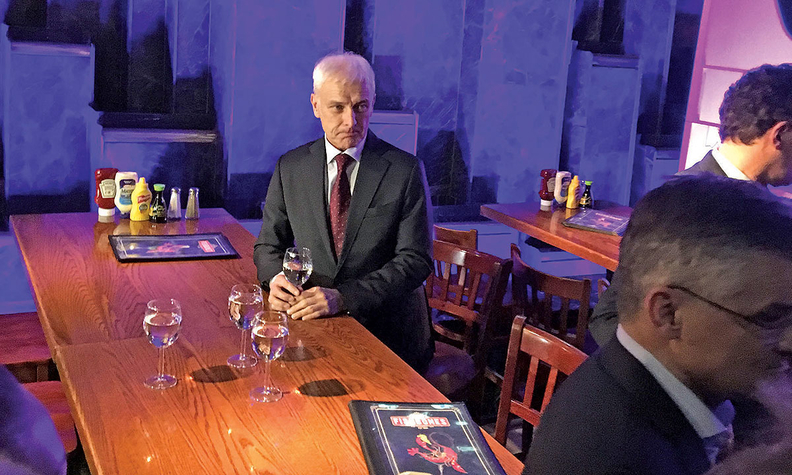 It was his first visit to the U.S. since becoming Volkswagen CEO in September 2015. BERLIN -- Volkswagen CEO Matthias Mueller will miss the Detroit auto show next week amid uncertainty over its chances of settling a U.S. criminal investigation into its emissions scandal. VW reached an agreement before Christmas to compensate U.S. owners of about 80,000 polluting 3.0-liter diesel cars, pushing up the costs of its emissions test cheating in the world's No. 2 car market to $17.5 billion. But VW is still in talks with the U.S. Department of Justice and could spend billions of dollars more to reach a criminal settlement, with sources saying a deal could be struck before the Obama administration leaves on Jan. 20. "There will be no separate event of the VW group (in Detroit) and in view of this fact, the group's executive board will not attend the show," a spokesman at VW's Wolfsburg headquarters said on Wednesday by email. At the 2016 Detroit show, Mueller drew criticism after telling National Public Radio that VW "didn't lie" when first asked about irregularities between real-life and test emissions in its diesel cars. The CEO's comments came before Mueller's first meeting with U.S. regulators and sparked a media firestorm in the U.S., with some analysts saying they complicated efforts to clear up the emissions scandal. VW's decision to not have Mueller and fellow managers of the group's nine-member executive board attend the 2017 Detroit show suggests the company wants to avoid taking risks as it nears an agreement with the DoJ. VW fears a reboot of its core brand in the U.S. could be delayed by six months or more if it fails to reach a deal with the outgoing administration, as the new Justice Department team would need time to get organized, a source at VW told Reuters. VW plans to drop diesel vehicles in the U.S. and refocus on SUVs and electric cars to try to revive its fortunes after the emissions scandal. Despite a 20 percent jump in December sales, the VW brand's U.S. sales fell 7.6 percent to 322,948 vehicles for the year.